You set the standard for how the work must be done. You hire the right people with integrity, knowledge, work ethic and skills who want to work for the guy who does the job right. The tough part is not just finding said tradesman, but retaining them with competitive wages/benefits. It's a dog eat dog business, but it all starts at the top. 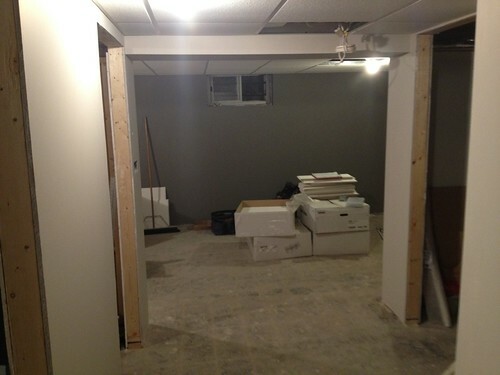 Thought I would post an update on the basement reno. 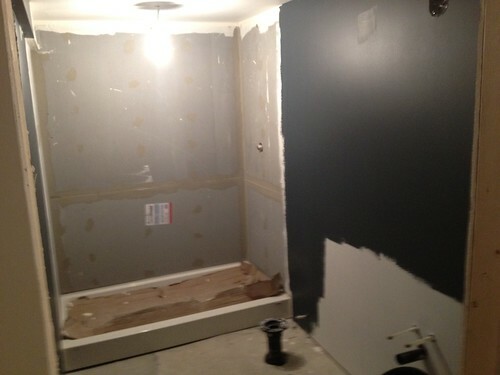 This looking into the bathroom with shower base, toilet and plumbing we have one coat of paint up before all the millwork and flooring is in just for efficiency. 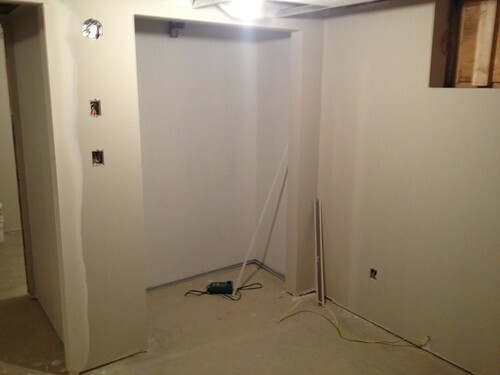 This is looking at closet and doorway to bedroom. Bit of a screw up here is the window size does meet code for a bedroom so we have not put a door on the room until after inspection. 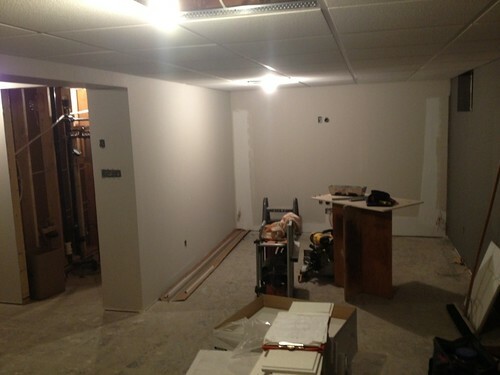 This is the laundry room or part of it where the washer and dryer will go and millwork. It's hard to get the whole room in a photo on an iphone. 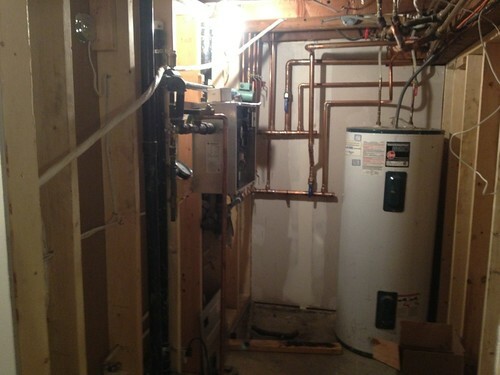 This is the new mechanical room with brand new electric boiler and all the plumbing- not cheap! This looks down at the media wall. Waiting for the millwork and the and accent features to go in. All the speaker wire as been run and there is a big 2" conduit pipe to run cables and from consoles to the TV. Finally this is looking back from the media wall. There is the new electrical panel and there will be millwork and storage buitl in around it but it has to be redesigned as we moved all that from a different wall when we changed the layout during contstruction. Still waiting on the flooring to arrive and then all the lights to go in and the final electrical tie-ins for dimmers and baseboard heaters as well plus the 'office' window. It's coming but man it's really ground to a halt while you wait for things to arrive. So close to being done I can taste it. There was a major screw up with our millwork order so that added a huge delay to everything. It's dragged on a bit the last two months due to a bunch of things with my contractor trying to beat the weather on his other jobs but there are two doors left to hang and that's it! Will post the final photos later. Right on Pete! Looks good.....what happened with pics on the most important piece of the mechanical??? the......HVAC? CFP! wrote: Right on Pete! Looks good.....what happened with pics on the most important piece of the mechanical??? the......HVAC? That is the HVAC! An electric boiler for my rads- mounts on a wall and is 100% efficient. I'll go in and do more photos a bit later. Show the nuts and bolts of it all. 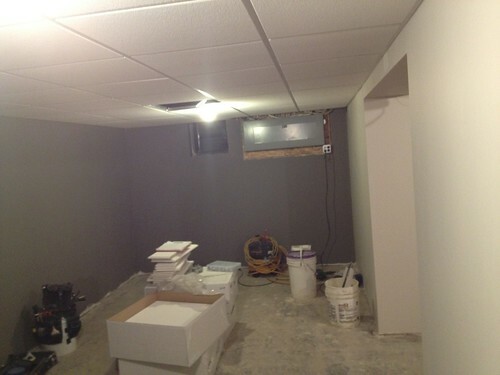 I don't see any 500 w lights or fans in that basement. Blob Mckenzie wrote: I don't see any 500 w lights or fans in that basement. Those are in the cave underneath- double heat protection. Wondering if I should post in this thread or not, but think I'll give it a try. Be nice to me, I'm an off-topic virgin. I live in Metro Vancouver and I've detected some moisture problems in my attic. Can anyone recommend a good company that specializes in... I guess ventilation/roof repair? I'm not an absolute idiot when it comes to home construction/maintenance, but this is a bit above my head, and not something I've dealt with before. BurningBeard wrote: I'm not an absolute idiot when it comes to home construction/maintenance, but this is a bit above my head, and not something I've dealt with before. I'm glad the pun wasn't lost on you. BurningBeard wrote: I've detected some moisture problems in my attic. Moisture problems. Um, yeah, the million dollar question. Ask Shell Bussey. Welcome to Creeper's Bar & Grill! That old fart? Is he related to you? I've heard that can also be cause by Oxycontin.